We are so excited about this feature on our website. Amy had a restaurant at one time and she has a plethora of wonderful recipes to share with you all, so follow along! There will be a new recipe each month in this space with the option for you to print it. Enjoy! All of these recipes have been given the ***** rating by the staff and customers of FARMHOUSE. This is one of my favorite dessert recipes! It is of course perfect for summer, but I make it in the winter too because strawberries are usually available. Since the berries are baked you can get by with ones that are not that great to eat on their own. Preheat oven to 350° and butter a 9” deep dish or a 10” pie plate (or 9” springform pan). Whisk flour, baking powder and salt together in small bowl. In large bowl, with electric mixer, beat butter with one cup sugar until pale and fluffy, about 3 min. Beat in egg, vanilla and milk until just combined, then gradually add flour mixture. Mix just until combined – don’t over mix. Scrape batter into buttered pan; arrange strawberries on top, pushing them down slightly into batter. They will be crowded and may overlap, but use them all! Sprinkle remaining 2 tablespoons sugar over top. Bake for 10 minutes, then reduce oven temperature to 325° and continue baking for 50-60 minutes. Test with a cake tester or toothpick – it should come out with no wet batter. Let cool on rack. 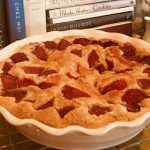 *Strawberry Summer Cake recipe came from my favorite food blogger, Deb Perelman’s fabulous website “Smitten Kitchen.” Her recipes are easy to follow, her pictures are wonderful, and she will keep you smiling with her writing style!